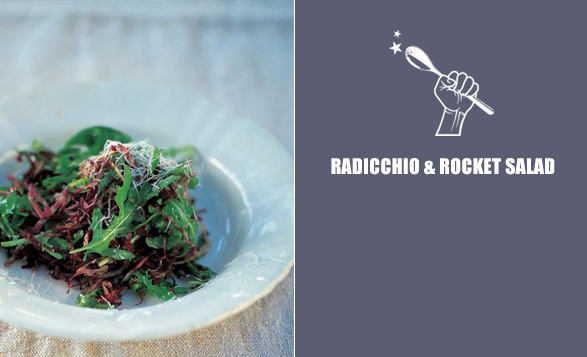 Get yourself a large bowl and, for each person, toss together a handful of rocket with a small handful of grated Parmesan cheese and a quarter of a radicchio, finely sliced. Dress this with a lug of balsamic vinegar, three times as much extra virgin olive oil, and a little sea salt and freshly ground black pepper. Mix carefully, grate over a little extra Parmesan, and eat straight away. You can vary it by adding things like toasted pine nuts, roasted red onions or crispy bacon.